See the Eufaula Lake website for additional information. Primary recreational opportunities are listed below. Directions: From McAlester, 23 miles north on US 69, 16 miles east on OK 9, 6 miles north on OK 71. Factoid: Eufaula Lake is the largest lake located entirely in the State of Oklahoma. It is located on the Canadian River, 27 miles upstream from its confluence with the Arkansas River. With over 600 miles of shoreline and 102,000 surface acres, Eufaula offers a variety of recreational opportunities for everyone. The shoreline ranges from vast expanses of sandy beaches to rocky bluffs. Boaters traveling through the Standing Rock area can admire the beauty that was admired by Spanish explorers. Over 250 housing developments with lake homes are located in close proximity to the shoreline. Most of these areas are within walking distance to the lake. Many offer public boat ramp access within the development. Mowing and boat dock permits allow property owners to mow government property below their lots and place private boat docks within walking distance of their property. 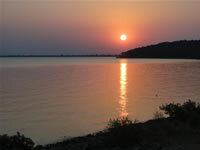 Eufaula Lake has long been recognized for its outstanding fishery. Crappie, sand bass, catfish and black bass in the lake reach record size. Below the dam, striped bass reaching over 40 pounds have been caught in the tailwaters. This fishery is popular year-round with catfish, sand bass and crappie being the most popular species. Visitors to Eufaula Lake should plan to take advantage of the opportunity to sight see in the historic town of Eufaula, where many antique shops and unique restaurants offer something for everyone. Other points of interest include the towns of McAlester and Krebs, where Italian restaurants are known worldwide. Robber's Cave State Park and two state parks located on Eufaula Lake offer a variety of recreational experiences, including golf courses, swimming pools, and hiking trails. Visitors in the fall will be treated to a collage of colors as the surrounding hills provide unparalleled beauty of fall foliage.